Paul & Penny Jenkin are the fourth generation to farm at Barton Farm. The Jendale herd of Pedigree Ayrshires was established in 1952 by Paul’s parents and has been a closed herd for 44 years. The first four bulls were brought from Hugh Alexander (Boxhill) Ltd, Surrey and were based on Howie’s and Ickam Bloodlines. Since 1966 all stock bulls used have been homebred. The breeding policy has always been to breed strong cows with high constituents and good udders legs and feet. Genus and Cattle Services bulls have been used along with homebred sires aswell. The difficult decision has now been made to disperse the herd and retire from Dairy farming. The herd is farmed on a simple system of grass silage and a small amount of concentrates fed in the parlour and are grazed at grass between March and November, housed in Cubicles and loose yards during the winter months. This is an excellent herd of Pedigree Ayrshires with long established cow families. On inspection the herd is very impressive with exceptional udders, legs and feet. The herd is farmed on a very simple system and we have no doubt they will go on to new holdings and perform well on more intensive sytems. 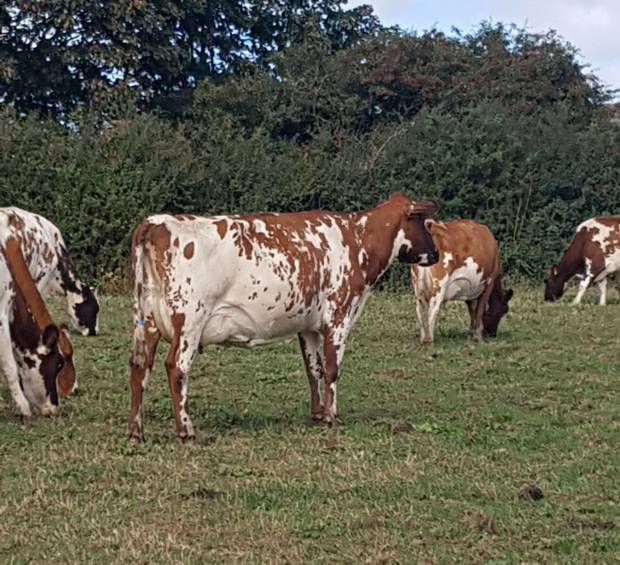 The herd has fantastic milk quality and with there being a large portion to calve later in the year and into the early spring this makes for a very attractive dispersal of Ayrshire Cattle! A sale not to be missed!